Spoil dad this Father’s Day with the gift of premium chocolate. 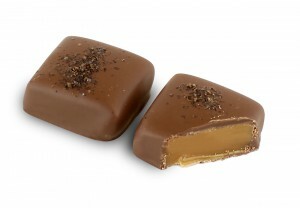 Ethel M Chocolates introduces its new Smoked Sea Salted Caramels just in time for the holiday. My hubby is a big caramel fan and sea salt always gives us memories of beach side strolls! The Smoked Sea Salted Caramels extend the gourmet line of chocolate caramels offered at Ethel M and are now available online and in stores. The new caramels provide a harmonious blend of Ethel M’s silky smooth milk chocolate and buttery vanilla caramel, augmented by the surprising boldness of a fine sprinkling of smoked sea salt. This flavor is created by smoking coarse sea salt with a blend of seven carefully-selected woods over 14 days. The caramels are available in the Design Your Own chocolate box collection, which offers a range of pieces are various prices. All products are made fresh in the Henderson, Nevada chocolate factory and are free of artificial preservatives. Father’s Day collections are available for purchase at all Ethel M locations throughout Las Vegas and online at www.ethelm.com. For those that order their gift online by June 16, they will receive 25 percent off their purchase using the code “LOVEDAD.” For the full chocolate catalog, please visit them online or follow on Facebook, Twitter, Instagram and Pinterest. About Ethel M ChocolatesEthel M Chocolates are manufactured by Mars Chocolate North America, dedicated to creating authentic chocolates with no preservatives. Ethel M Chocolates are available in multiple locations throughout Southern Nevada, online at www.EthelM.com or by phone at 800-438-4356. The Ethel M Chocolate factory and Botanical Cactus Garden are located at 2 Cactus Garden Drive in Henderson. For more information on the Botanical Cactus Garden, events, store hours, locations and ordering products, please visit online or follow on Facebook, Twitter, Instagram and Pinterest.